‘Hedge-hopping’ is a much talked about feature of our holidays. The subject is met with excitement, trepidation, anticipation, fear, bravado and everything in between as it really is an unknown quantity for the vast majority of our American guests. We have all heard that there is no substitute for experience. However, a little preparation never goes amiss, and anything to concentrate on to distract from pre-hunting nerves gets the thumbs up from us. It is in this spirit that we have put together a short video and accompanying blog below, explaining a little of how we prepare ourselves and our horses for popping the hedges in style! This isn’t meant as a concrete instructional guide, but more as a collection of basic principles that work for us. If anyone has any questions/challenges/improvements/ideas, we’d love to hear from you! We understand that not everybody has the facilities to school their horse on an all-weather surface and practice over a cross-country course (and neither do we!). These exercises can be mimicked with very basic drums and poles and the odd cross country fence. A hedge-like appearance can be given to a fence with the help of some brushwood or similar – the idea is to get used to a ‘hairier’ looking fence. Meg checks her balance – no need for smart facilities! 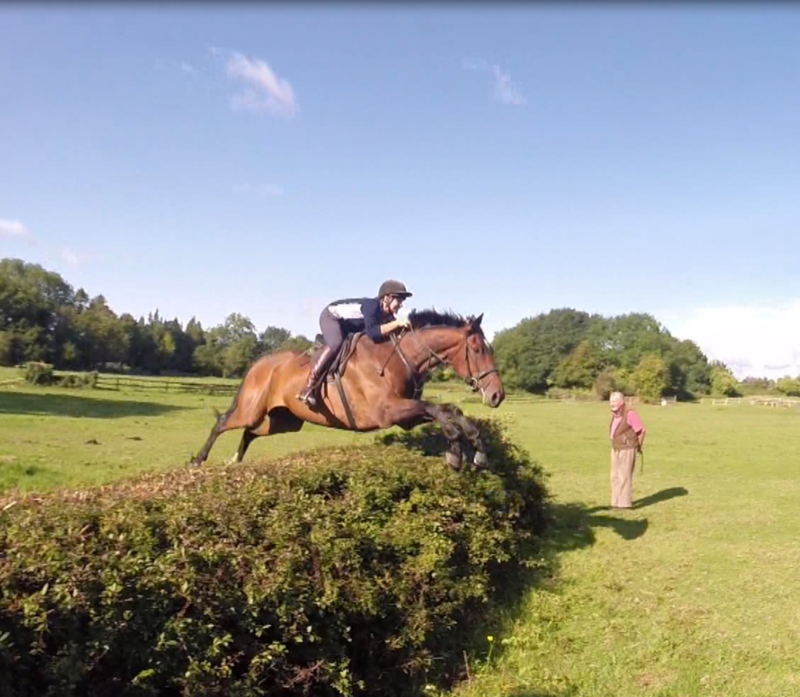 The main difference between jumping a hedge and jumping a rail is that you can’t see through a hedge! This means that often you and your horse don’t know how wide it is, or what is on the other side. There could be a ditch, wire, a boggy patch of ground or a big drop. It is often better to ‘attack’ a hedge with a bit more impulsion than we would a rail, to make sure we clear the width of the hedge, plus any ditch. A more upright position (particularly on landing) helps to stop us from being thrown forward on landing. We need to allow the reins to slide through our hands to make sure we don’t jab our horse in the mouth, and to allow him to balance. Soft hands and impulsion means my horse can really stretch over a hedge in the practice field – under Grandpa’s watchful eye! Legs – Keep them strong around the horse to give him confidence and maintain impulsion, with heels down as always. It helps to try not to let them creep too far back as you jump, as this will make you tip forward on landing. Hands – ‘Soft’ hands are important so the horse can stretch and stays confident. During any ‘iffy’ moments, it’s good to get in the habit of grabbing the neck strap to keep your balance, letting the reins slide so that the horse can balance himself. Sitting up – Sitting and looking up keeps your weight back, making sure you aren’t thrown forward on landing, should there be any little surprises! Sitting up on landing, with legs forward and letting the reins slide makes sure my horse stays confident and I stay in the plate! 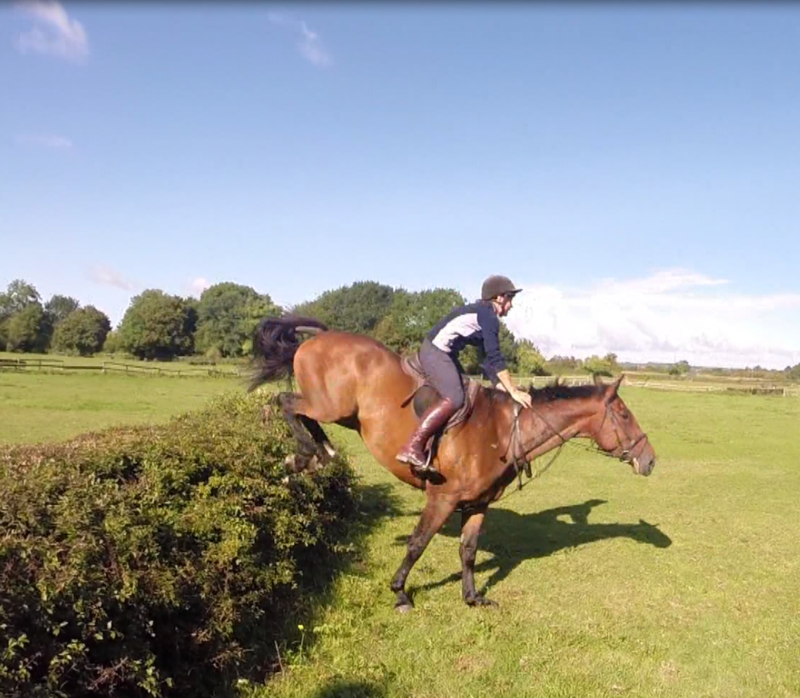 Rhythm – It is good to maintain a strong, forward canter into a hedge to make sure you clear its full width. Straightness – As with any fence, it is important to stay straight. In particular with hedges, it stops you making them wider than they are by jumping on an angle, and if everyone holds their line, it makes sure there are no collisions! 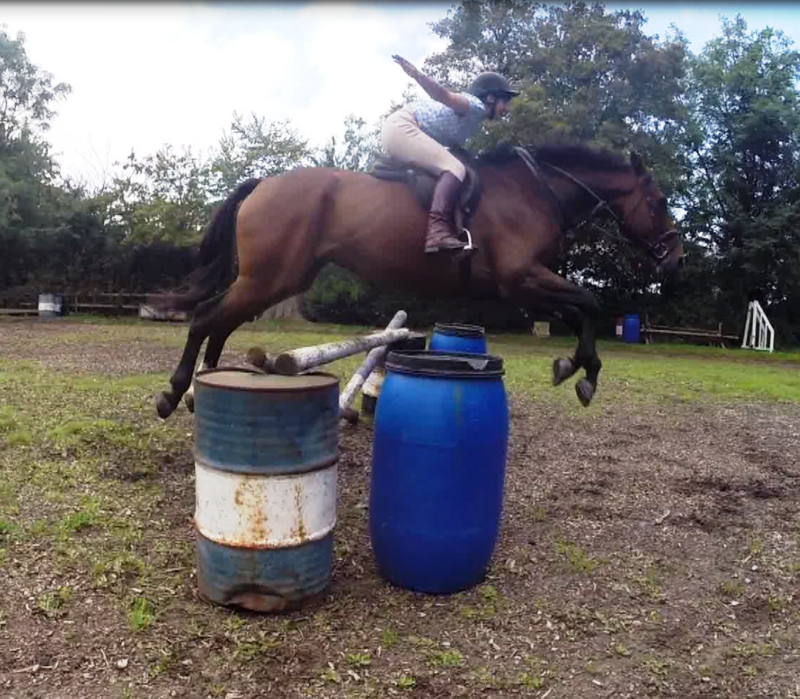 Positivity – Riding positively keeps the horse confident – he’ll keep jumping for you all day! The video this blog accompanies can be found below- enjoy! We look forward to seeing you mounted on a Blackthorn & Brook horse, jumping hedges in style with us in the very near future!